Zircon is a silicate of zirconium. Its formula is ZrSiO4 it often has traces of radioactive thorium and uranium which are often present by substitution in the crystal, which is not the case with most other elements and which allows this mineral to be dated. Zircon does not undergo any phase change when it is subjected to high temperatures and pressures; it is practically unalterable except by radioactivity, which produces a metamict state (a disordered state in a crystal that may be accompanied by a change in colour and an alteration that can extend as far as an amorphous state). A zircon crystal can therefore remain intact in rocks that have undergone strong metamorphisms: the initial rock can thus be dated to before the metamorphism occurred (see the article on the various methods for dating minerals and the periods covered). It is sometimes even possible to determine the conditions of this metamorphism because the zircon crystal can have forms that vary a great deal depending on to the conditions. 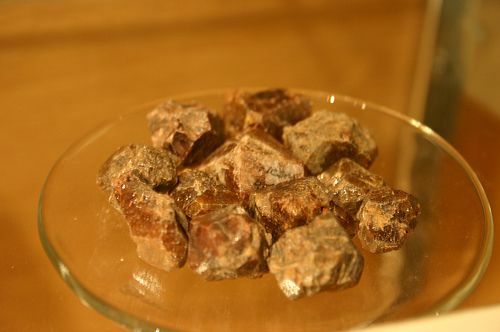 It is a rare mineral occurring in lava and tuff, but also relatively frequently in granite, gneiss, pegmatites, often in inclusions in the biotite contained in these rocks. It can sometimes occur very abundantly in syenites. Zircon is also a gem stone. Etymology: from Jargon, yellow zircon or from the Persian Zargun golden-coloured. 1.- Age of the Canaveilles metagranites in the Pyrenees and the Montagne Noire (France): U-Pb on zircon (isotopic dilution and SHRIMP) after an article by Alain Cocherie et al. Bull. Soc. géol. Fr., 2005, t. 176, No. 3, pp. 269-282. Depending on the quality of available zircon and the nature of the geochronological problem, two U-Pb methods on zircon can be used to date the crystallisation of an igneous rock: either the U-Pb method by isotopic dilution after dissolution of the grains and analysis by TIMS (thermo-ionisation mass spectrometry), or by U-Pb analysis in situ using a high resolution ion microscope (SHRIMP). These two methods are indispensable for the unambiguous dating of granitic protolith formation of various orthogneiss in the axial zone of the Pyrenees, for a long time considered to be a "Cadomian basement". Identical ages within error limits have been found as 477 ± 4 M years to 467 ± 7 M years. These datings show that the formation of protoliths dates to the end of the lower Ordovician. Furthermore, a metarhyodacite near Canaveilles has been dated to 581 ± 10 M years (SHRIMP), thus making it possible to date sedimentation to a pre-Ordovician era. Finally, equivalent orthogneiss specimens in the Montagne Noire (orthogneiss of Somail) have an identical age to those of the Pyrenees at 471 ± 4 M years. Between the lower and middle Ordovician the intense magmatic activity and the sedimentological variations characterising all of the southern European terrains (the Armorican Massif, the Massif central, the Alps, Iberia, the Pyrenees and the Montagne Noire) plead in favour of an "individualisation" of these terrains in comparison to the Gondwanian boundary. Zircon typology suggests that they were formed by crustal and sub-crustal fusion in an abnormally hot environment. At the end of the Ordovician, this magmatism evolved into alkaline basalts (the dome of Pierrefitte, the central Pyrenees) where the granite has an alkaline tendency (Casemi gneiss, Canigou 425 ± 8M years). In the Pyrenees and the Montaigne Noire the unconformity of the upper Ordovician over the Cambrian indicates the existence of a moderated deformation and an emersion resembling an emerged distensive cordillera. It is in such a thermal intumescence that the origin of the Ordovician plutonism of the Pyrenees and the Montaigne Noire can be envisaged. Liquid water existed on the surface of the Earth more than 4 G years ago. It was the study of zircon crystals that made this discovery possible. These crystals were formed during the Hadean eon, a period stretching over 500 M years, from 4.5 to 4 G years. (photo Prof. John W. Valley, below). A heavy oxygen isotope signature is observed in the zircon crystals from this epoch, a clue to the presence of liquid water at the surface 4.3 G years ago. Microscopic view by cathodoluminescence of a zircon crystal (zircon grain - W74/2-36) of which the age has been determined to be 4.4 G years (small spot indicated on the image) making it the oldest known mineral on Earth today. Chemical analysis indicates that the Earth must have already been cool enough for there to have been liquid water (a hydrosphere), and it may therefore be possible that life is older than we thought. Zircons of two different ages. Here, the black part of the crystals is dated at 1.7 G years; we can see that this part has partially dissolved and that the crystals started to grow again - the white part of the crystal - but at a much later date. This part is in fact dated at 1.2 G years, 500 M years later! These crystals were found in Augen gneiss. © Common project - Prof. Drew Coleman (University of North Carolina) and Dr. Joe Wooden (USGS) – tectonics and formation of the continental crust (California).